This official press photograph shows Stephen Hopkins at the ready with his M1 rifle. Stephen Peter “Hoppy” Hopkins had one of the most recognizable names in the entire battalion. His father, Harry Lloyd Hopkins, was an important political figure during the Roosevelt era, and at the time of Stephen’s enlistment was serving as the President’s chief diplomatic advisor. Hopkins graduated from Philadelphia’s prestigious Hill School in 1943, and initially hoped to be a Navy flier. However, the prospect of long training (most officers had at least a partial college education) and a fear that his commission would smack of nepotism on the part of his influential father, led him to abandon this dream and join the Marines as an enlisted men. “My dad has believed in this war since it started, and so have his sons,” he declared upon reporting for duty with Captain Irving Schechter. “I’m anxious to go overseas and back up what my father stands for because I stand for the same things.” His wish was granted, and Hopkins was assigned to a machine gun crew in the company’s Weapons platoon. Hopkins became close friends with George Smith, his squad gunner, and made a good impression on his NCOs and platoon leader, Lt. Philip Wood. Despite “his return address being The White House,” Hopkins fit right in, sharing the hardships of training (he almost drowned on a nighttime boat exercise) as if he’d been born to it. Shortly before heading overseas, he seemed to have a premonition of his fate. “I don’t think I’m coming back from this,” he said to Smith. When news of his death reached combat correspondents, they descended upon his still-shocked company and squad asking for heroic stories. The Marines obliged, stretching the truth in some cases and obliterating it in others. Rumors that Hopkins had been killed by friendly fire were quickly put down. The story was put out over the AP Wire Service, and variations appeared in many newspapers around the country. The following are samples of the reports covering the death of Stephen Hopkins. The most eloquent account was written by Gilbert Bailey, a combat correspondent who sought out Company A to tell the stories of both Steve Hopkins and Sergeant Frank Tucker. This version of his story ran in the Nebraska State Journal on February 18, 1944. Kwajalein Atoll, Marshall Islands, Feb. 14 (Delayed) – The buddies of Marine Private First Class Stephen P. Hopkins today told how the son of Harry Hopkins, presidential adviser, died a hero’s death on wind-swept Namur Island. If it had not been for the cool courage of the 18-year-old boy they knew as “Hoppy,” some of them would not be alive to tell the story. 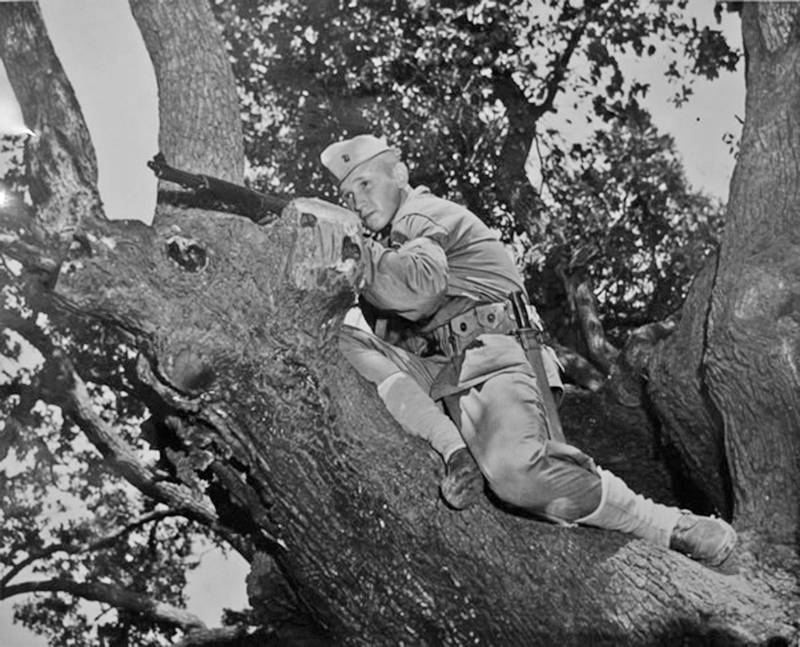 Two nights after he was mortally wounded, some of his closest friends in the service, men of his machine gun company, were digging foxholes near the spot where he was picked off by a Japanese rifleman. Tears washed some of the sand from a corporal’s cheeks as he related: “It was during the second night of the battle for the Marshall Islands. Private First Class Hopkins was working as an ammunition carrier and flank security man when his outfit was called in to relieve a badly battered company. Several Japs had already been killed near the beach in an encounter with the first pillbox. About 50 of the Japs remaining fled toward a trench about 50 yards to the rear. Twelve marines, including Private First Class Hopkins, were out in front of their main body chasing the Japs toward the trench. “In the heat of the fighting a Jap who had been passed up as dead suddenly rolled over with a grenade poised in his hand. Hopkins, the only man who saw him in time, quickly shot him through the head. “During the early part of the night Hopkins went back three times through heavy enemy fire to bring up ammunition, when the supply ran low, then took his place again as flank security man on the front lines. He was removed by a corpsman to the emergency medical station and then to a hospital ship, where he died of a head wound about 4:30 the next morning without regaining consciousness. The next morning when the fighting began again around the same trench, the first Jap was killed 10 yards in front of what had been young Hopkins’ position the night before. About 75 Japs had been killed in the bitter exchange of fire during the night. An estimated five marines had been killed and 10 wounded. They didn’t know much about “Hoppy” before he came into the Corps. He had just graduated from [the] Hill School in Pennsylvania when he enlisted in the marines and went thru “boot camp” at Parris Island. When Sgt. Lewis Gregory of Baltimore, MD., his old drill instructor at Parris Island was transferred to the Fourth Marine division, Hopkins asked to be sent with him to combat duty. Sergeant Gregory was fighting near him when he was hit.